There was an article I read yesterday about a study of screen time and its affect on language development. Check out the article here for more information: screen-time-speech-delays-study. The more we use technology in this digital era, the more some of us are beginning to question the benefits and pitfalls of an increasingly “technified” world. We spend lots of time connected to technology. We shop online. We use social media. We track our fitness. We play games. We read news, blogs and research articles. We even listen to the radio online. This is great that we can use technology to enhance our lives and get things done more efficiently. As a mother of 3, I sometimes think that if I didn’t have a smart phone, I would not get done half of what I do just using my phone! But whatever you think about the use of technology, there is one thing we do not fully know yet, and that is its effect on how children who grow up with it will end up developing communication. Technology in its raging popularity is fairly new. Even in my lifetime we have gone from dial up to broadband and landlines to smart phones. 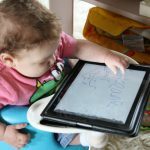 This study is just the beginning of looking into the effects of technology and more specifically “screen time” on developing speech, language and communication It is important to think about the purpose of screens for children and mostly they are used for entertainment even though much of the entertainment is considered educational. But, we need to get a few jobs done without the house being trashed. For children under 2, speech and language therapists have been recommending no tv. This is often harder with subsequent children if there is an older child interested in using a screen. Then, what does that mean for iPads, phones etc. What is really important is that the screen use is a much more passive event that does not involve any interaction with a real person so it means that they are not practicing communication during the screen time. Communication is live and active and involves joint attention and interaction where a child can fully relate to another person, no matter how educational something is on a screen, nothing can replace a real live person. So what should we do? First, stop and think about what you can do without a screen before reaching straight for the iPad or the remote. Next, choose screen activities and viewing very carefully to ensure you are aware of how it is being used. Lastly, use the screen time as an opportunity to view or engage with the activity together. There has also been a recent study looking at blue screen light and sleep so they are now recommending that all screens are turned on an hour before bed to give the brain a chance to relax and get ready for sleep. Sing! Sing songs you know, or make up songs about whatever you are doing. Make up story songs in the car or at bedtime or anywhere. Get the music on and sing along and dance if you like as well. Play games. Games like “I spy” can be fun for all ages, and you can look for things by colour, shape, letter/sound, description. Simon Says helps develop syntax for following and giving directions. Explore. Get outside, find things in nature and create a collection from your adventure with a treasure basket or by making a story stick/ journey stick creating a story of your outdoor walk with natural objects tied to a stick. Read, read, read. Joint book reading is powerful for promoting language development even if you don’t actually read the words. You can talk about the pictures together and get just as much out of the activity in terms of language development. Try not to ask too many questions but wondering aloud is a good alternative. Make something. You can cook, bake, paint, draw or make a craft. Being creative and exploring your imaginations together will be fun for everyone and give lots of opportunity for slowing down verbal conversation and making the experience more meaningful and conducive to learning. Do the housework. You can sort laundry, tidy up the house by putting things away in categories or get outside and do some gardening. 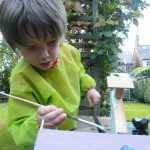 Each of these activities involves lots of exciting key words and steps of what needs to be done and will help develop sequencing skills as well as lots of multi-sensory concepts.